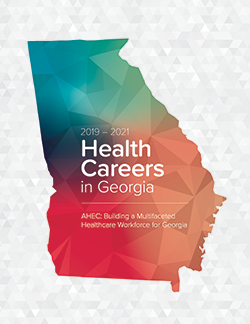 In conjunction with local partners, SOWEGA-AHEC develops and implements health careers awareness and recruitment initiatives to increase knowledge of health professions and career pathways for students and those seeking a healthcare career. We visit schools and career centers throughout our 38 counties to provide literature and discussions on health careers, educational programs and requirements, job opportunities, healthcare trends and interactive games. Request a presentation from the Health Careers Coordinator. Request an appointment to meet with one of our career experts to help guide you in your health career decision. One-on-one guidance is available to students. Are you interested in becoming a primary care physician? The Pathway to Med School program enhances your chances of getting into medical school. AHEC Scholars is a multidisciplinary program that gives health professions students a unique opportunity to practice hands-on training, provide care in rural/underserved environments, work with other students, build their resumes and increase professional contacts. Set yourself apart and develop skills that will transform healthcare in Georgia. The Health Careers in Georgia manual is a comprehensive guide with over 80 in-demand health careers. Download a free copy. We collaborate with schools and other organizations to conduct MICRO camps and intensive programs for students. These “intensive” programs offer a deeper exploration and expose students to a wide variety of healthcare careers via hands-on activities. Contact SOWEGA-AHEC for dates of upcoming intensive programs in your county. We have curricula, lesson plans, activities, supporting materials, DVDs, videos, and games used by K-12, colleges, universities, DOLs, career centers, AHECs, and many other organizations throughout the U.S.
We are able to arrange shadowing experiences with nurses and many allied health professionals. Request an appointment. We offer presentations on a variety of health career topics for after-school programs. Interested? View videos that allow students, teachers, and adults to see opportunities in many fantastic health careers that pay high dividends with job satisfaction, earning capacity, and mobility.